All pieces sold with accompanying Certificate of Authenticity. Please click on any image for a larger photo of individual pieces! This Hohokam effigy was originally collected in the late 19th century to very early 1900's and a part of the famous Edward Payne collection of Peoria, Illinois. 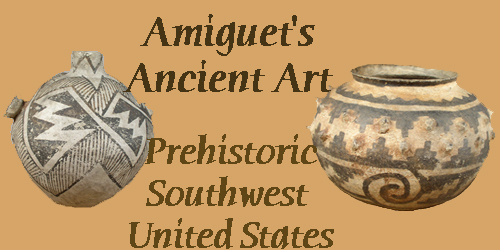 Mr. Payne was an ammasser of cultural artifacts from around the world and particularly known to own the United State's largest collection of Native American Prehistoric relics in the 19th century. The collection of Edward Payne was sold during the Great Depression and a local oil tycoon, Mr. Richard K. Meyer Sr., purchased approximately one third of the collection and continued expanding his ethnographic collection into the 1970's. 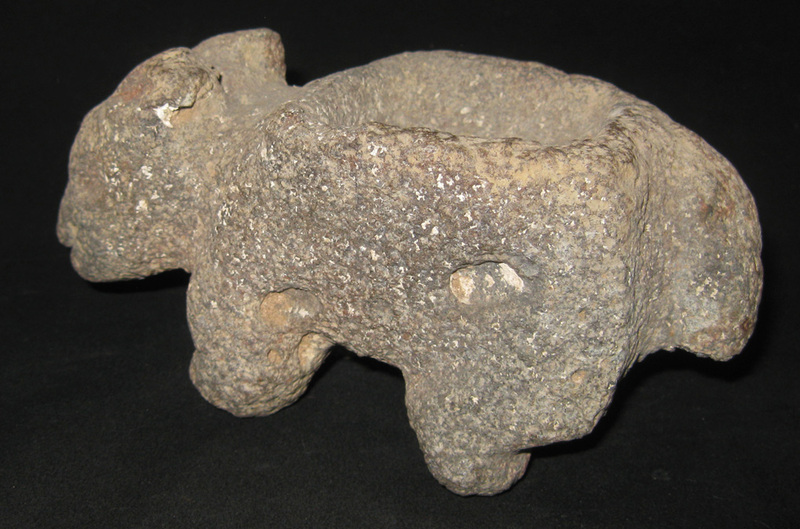 MP349 A Fabulous Hohokam gray volcanic stone effigy of a sturdy four legged mammal, most likely, depicting either a Coyote or a Desert Bighorn Sheep Ewe. 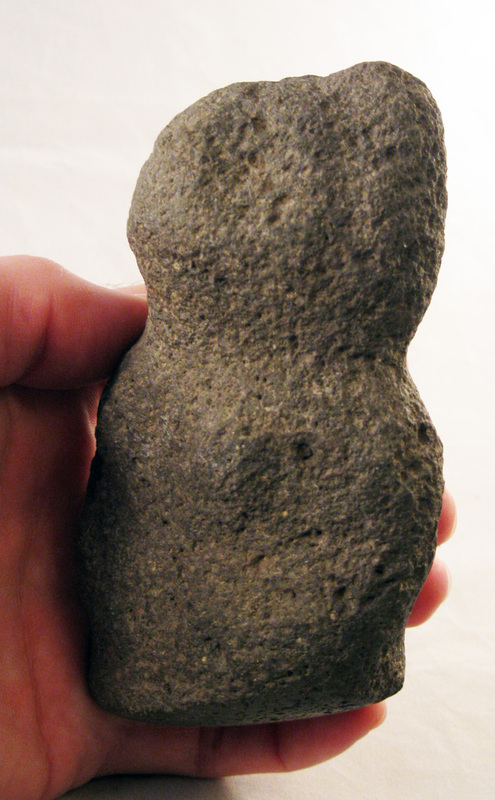 Carving is formed from a heavy gray stone, probably basalt, and in a rectangular block form. The body of the animal is a thick rectangle supported on four short thick legs with appropriate shaped bends to the legs and the top features a concave recess bordered by four corners. To the rear is a long tail, a portion damaged and missing. The front of the sculpture has a large, thick head, with a grooved mouth, pecked recesses for eyes, and tall ears. The creature appears to be in a relaxed pose, possibly grazing. 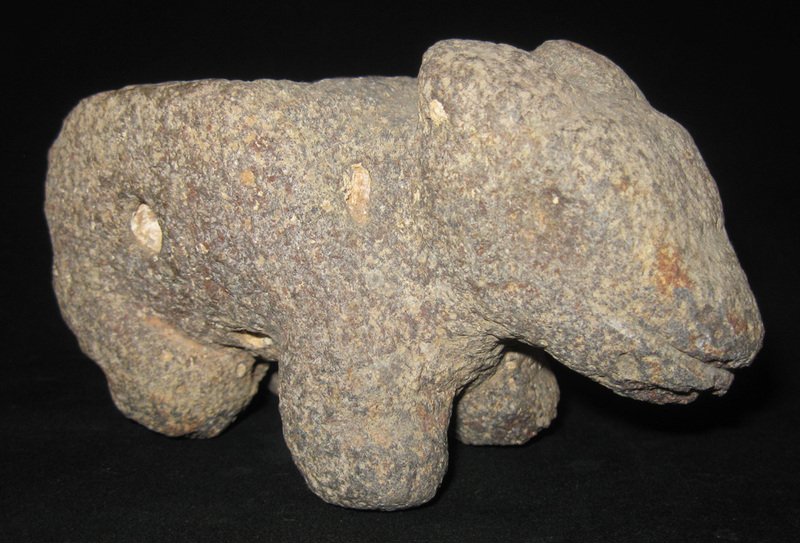 This rare figural stone carving is a wonderful larger size at approximately 6 1/2 inches long, 3 1/4 inches tall, and 2 1/2 inches wide. 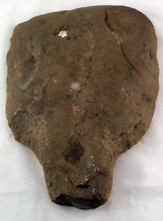 Intact condition, missing a portion of the tail, and with excavation tool surface chips to the underside of the mouth and two of the feet, otherwise, quite wonderful. 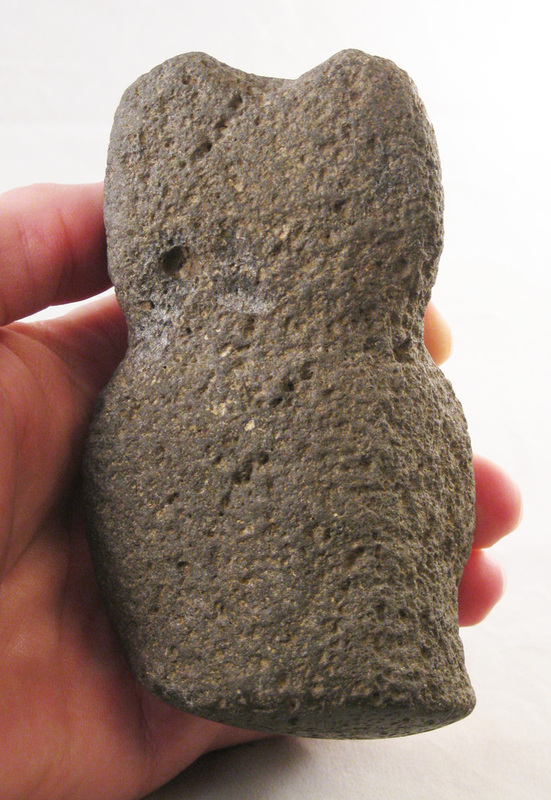 The dense stone carving weighs just over two pounds, quite heavy for small carving such as this. Hohokam Culture of Arizona, United States, circa 800-1200 A.D.
MP350 A beige stone Hohokam effigy mortar in a rounded form depicting either a coiled rattlesnake or a desert tortoise. 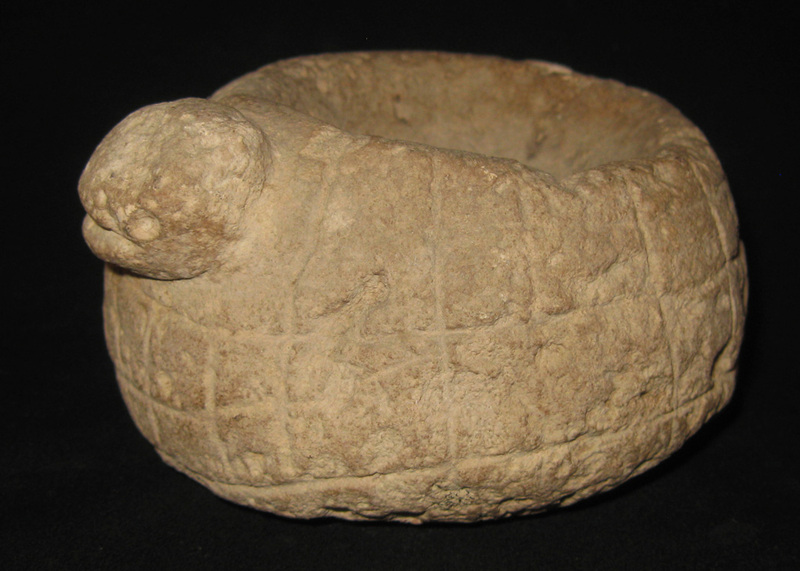 The donut shaped stone is incised with a coiling effect with panel separations, more indicative of a snake layering upon itself, and with a protruding small head with large open mouth and drilled eyes, much like a turtle, and the rear features a relief image like a tail with three incised notches. 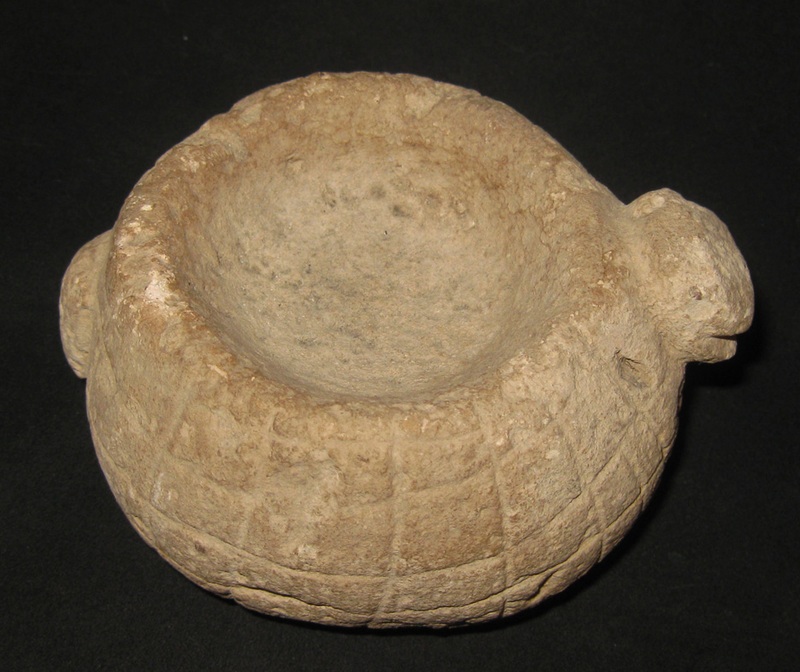 Appearing to be more serpent bodied than tortoise, the image has a shallow mortar recess in the top and the underside with curving features showing, possibly, this had started as a mano grinding stone before being embellished and re-purposed into the existing effigy. 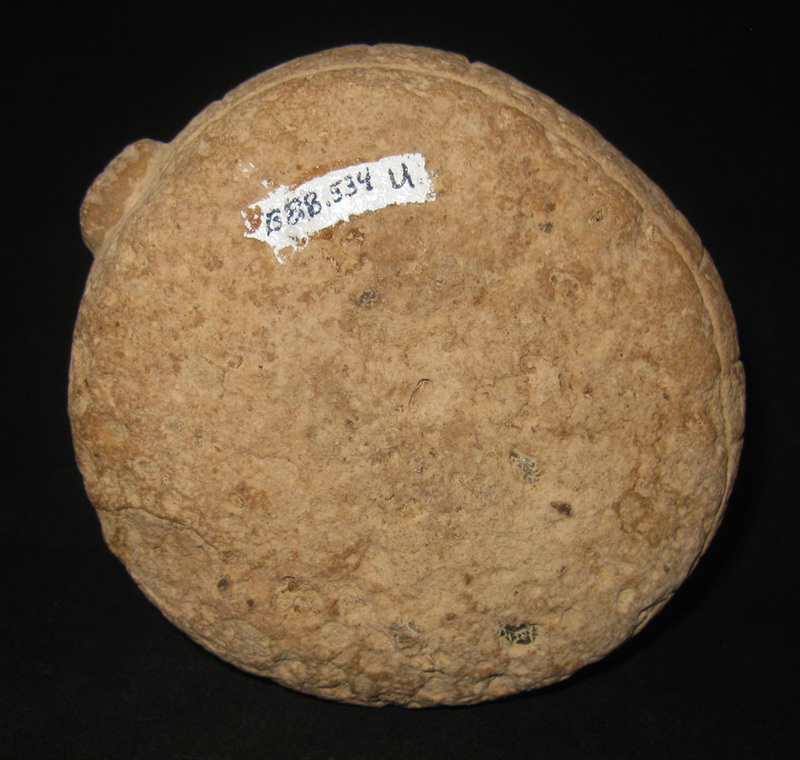 The stone holds strong patina and measures 2 3/4 inches tall with an approximate diameter of 4 inches. The stone exhibits various ancient chips and surface nicks, and is overall intact. Underside has a museum collection number from being on loan to a museum for decades. 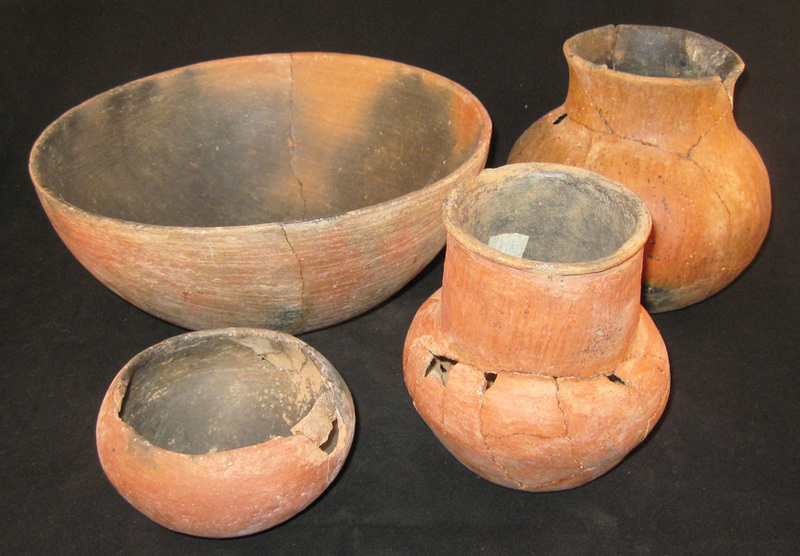 CL515 A 'beginning collector' lot of four southwestern pottery vessels, all, probably, Salado culture of Arizona. The four pieces all have smooth surfaces with red and orange painted exterior walls with blackened interiors. 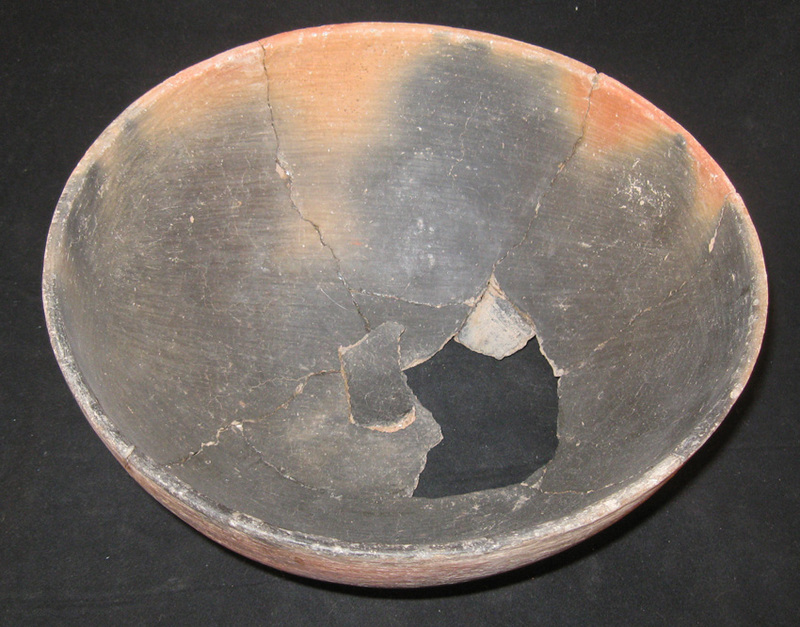 The large bowl is reconstructed missing some sherds from the center. 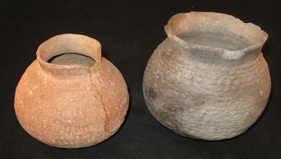 Rear right jar has an orangish polished surface with golden mica flakes, heavily reconstructed missing several pieces and covered with dendritic growths. 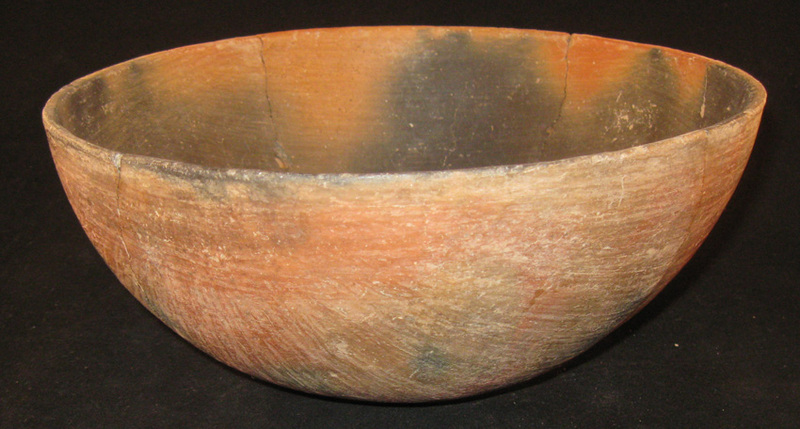 The front right is red painted with the body heavily reconstructed, missing much of the center base. 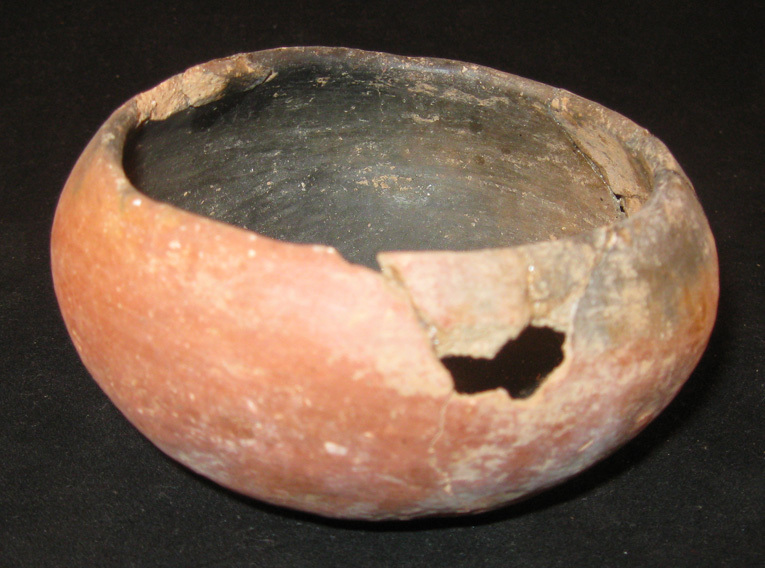 Last, on left front, this short bowl has some sherds reglued on one side, chips to rim, and a puncture hole. 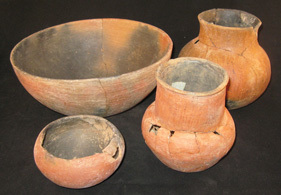 All pieces from Arizona, ca. 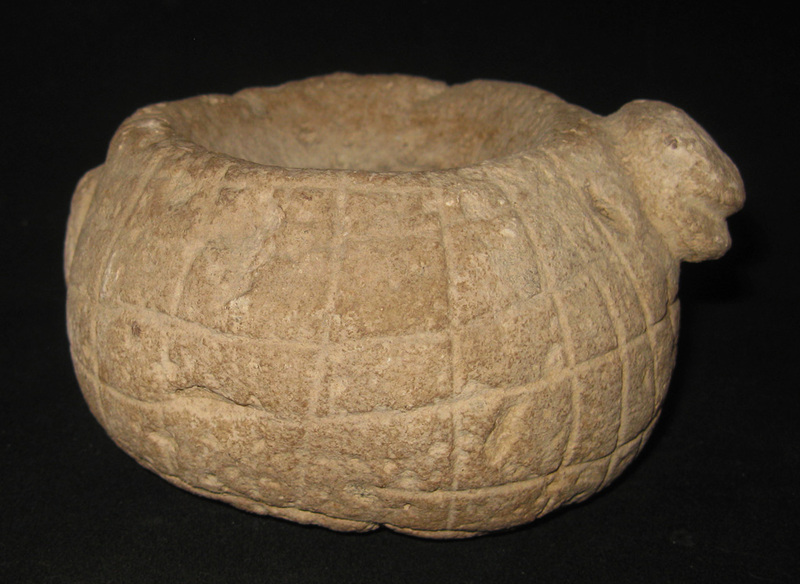 300- 1300 A.D.
CL512 A wonderful bell pestle or maul from the northwestern coast of the U.S.. This very attractive example is carved from a dense, heavy stone, possibly granite, with a deep dark green hue appearing to be black. The grinding tool is formed with a flattened round finial with a flaring middle coming to a mushroom cap shaped grinding base. 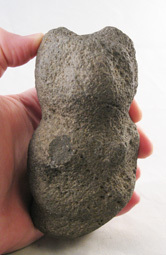 The stone is heavily worn with strong ancient patina, sitting upright at 7 1/8 inches tall, nearly 4 inches wide, and weighs nearly four pounds. 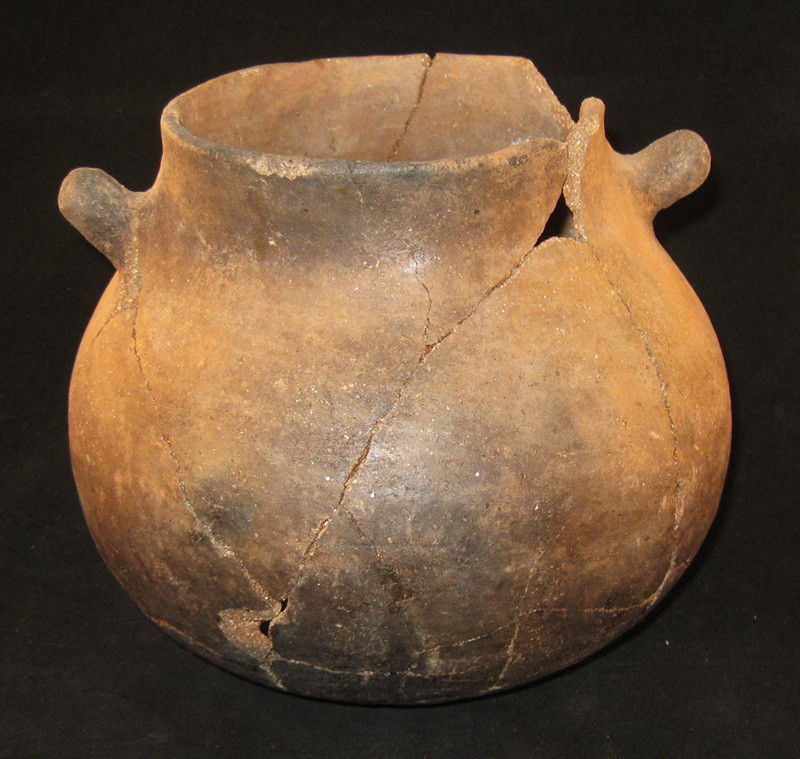 The example suffered a large ancient fracture to one side, otherwise is intact with great surface patina. 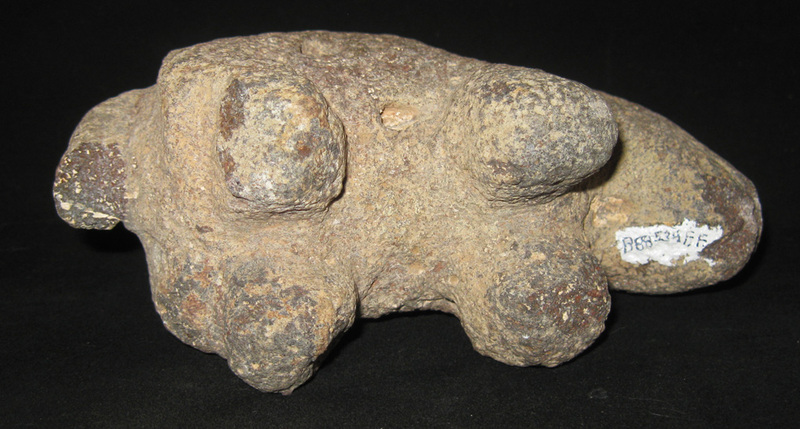 Such fractures are fairly common because such a tool would have been used for easily grinding maize or nuts into a mush with very little effort and, on occasion, a hammering device or wedge. Prehistoric, Washington State. 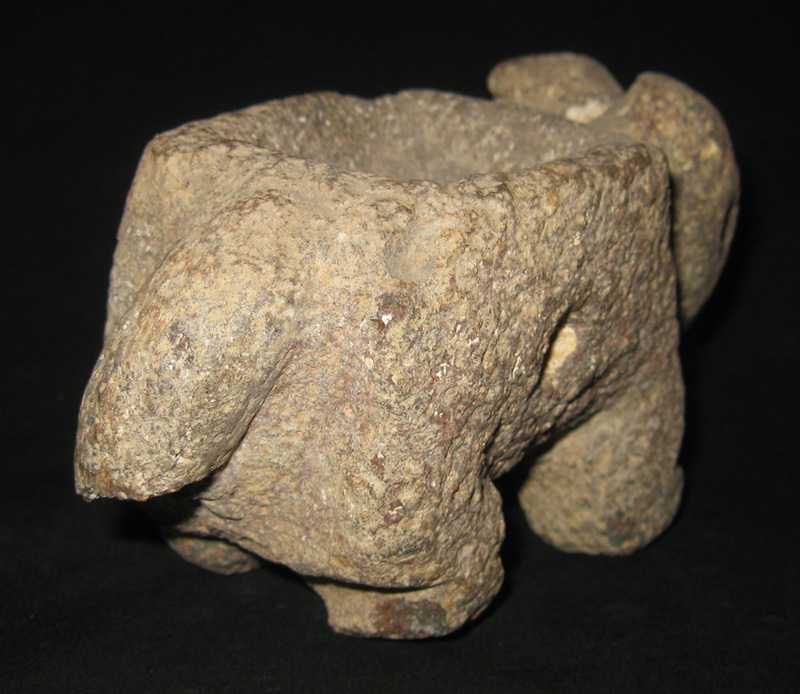 CL513 A particularly Rare Northwest coast bear effigy stone pestle. This highly unusual ceremonial sculpture is carved from a very dense volcanic gray stone rendering the image of a standing bear with human female breasts, which, is frequently referred to as the 'Bear Mother'. The image is better appreciated in person due to strong use and only lightly defined curves. 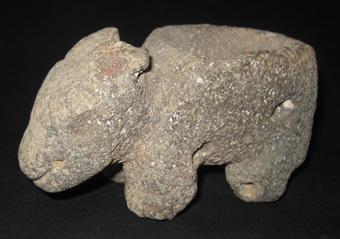 The sculpture shows a bear head with raised ears, recessed eyes, a wide nose, and arms curving on the torso; then, interestingly, the sculpture shows two pointed breasts, one side shaved off from farming machinery. This tool is highly ground and polished smooth on the grinding base, as if it was used predominatly for soft materials. 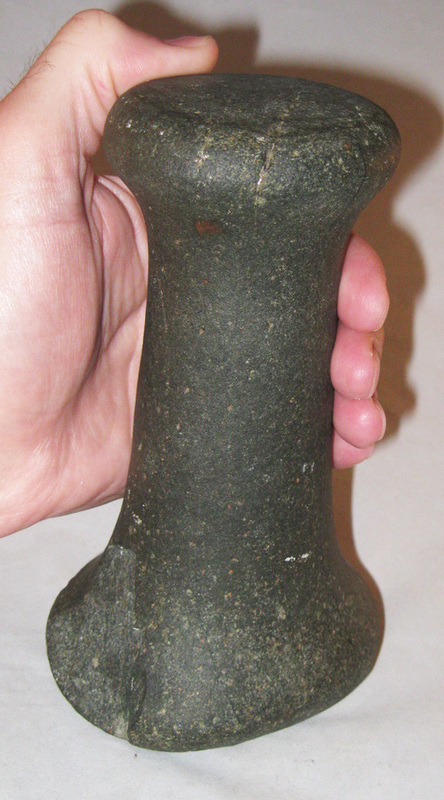 Quite an unusual pestle at approximately 5 inches tall, 2 3/4 inches wide, and 2 1/4 inches deep. CL516 A larger sized Historic California cooking vessel. This utilitarian pot is is formed from a smoothly polished brown pottery with golden mica flakes, shaped with a round body and slightly corseted neck having two small lug handles. 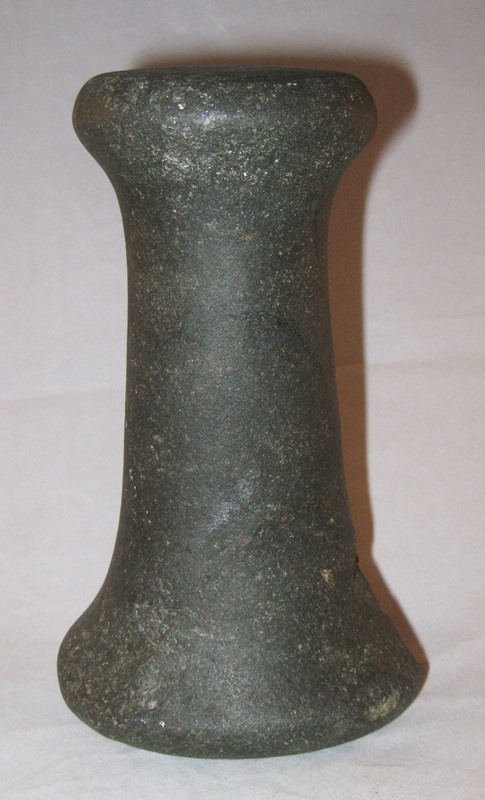 Sits on a slightly flattened base at 8 1/4 inches tall with a 9 inch diameter. 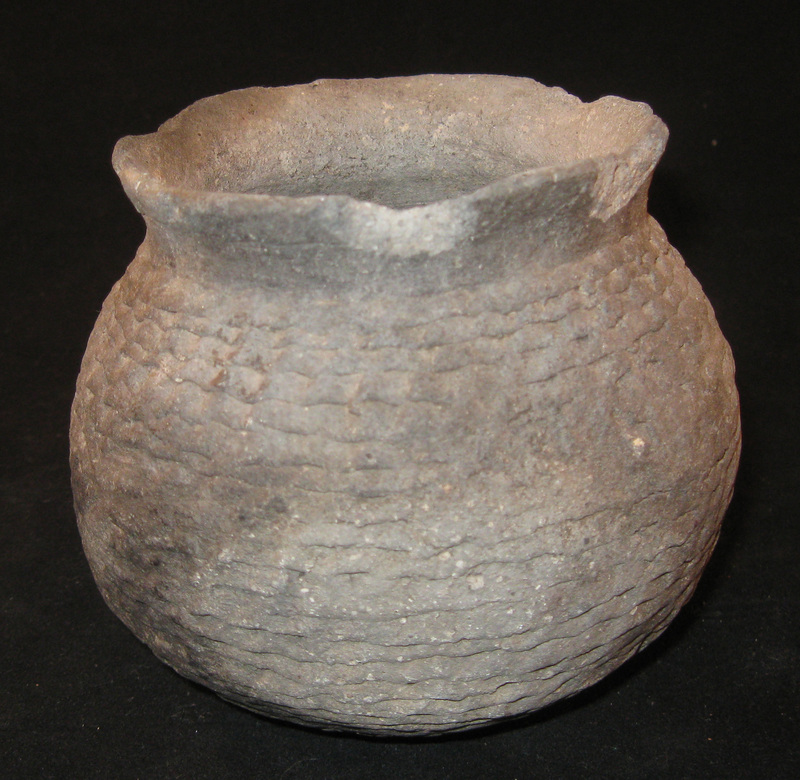 Jar is reconstructed nicely from many original pieces, approximately 95% complete, missing only small sherds, and exhibits nice old patina, the interior with strong pitting wear. A very nice sized and decorative example. Southern California, Pre-1900, probably ca. 1750- 1870 A.D.
CL517 A lot of two corrugated jars, one a Hohokam red painted, the other, a gray Anasazi. 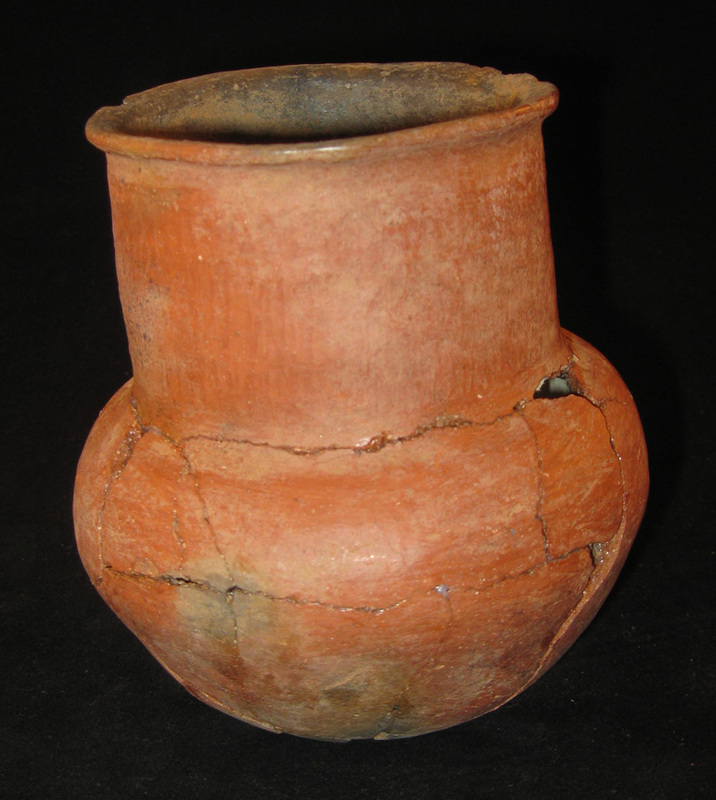 The smaller, at 3 1/2 inches tall and approximately 4 1/4 inches diameter, is well handled with one side being reconstructed from a few original pieces, missing a shard at the rim, and with nice deposits. 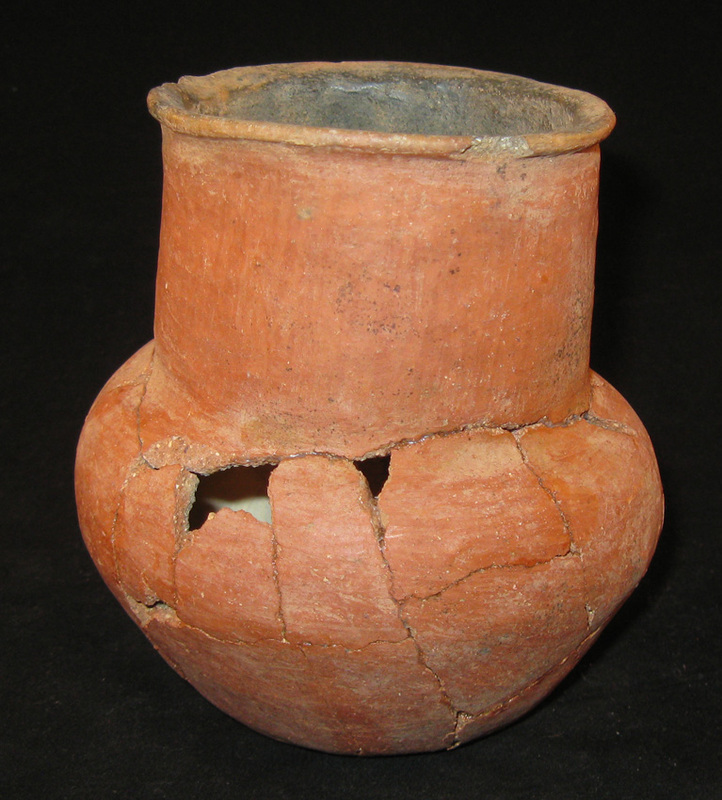 The other has more detailed design, the underside with some fracturing and two reattached shards, with rim chips, and sits nearly 4 1/2 inches tall and approximately 4 3/4 inches in diameter. Both could use proper conservation. 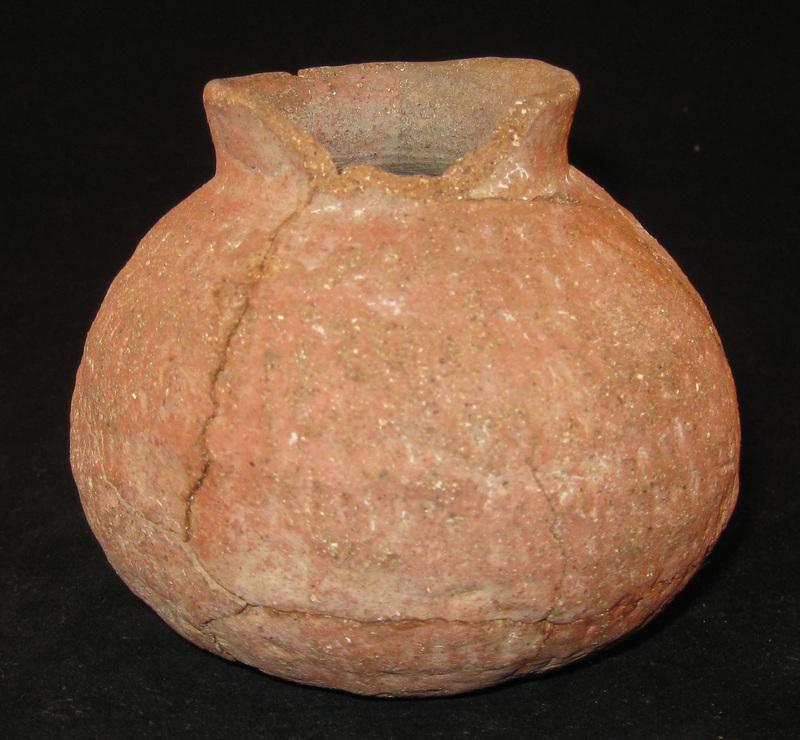 Arizona, circa 1000- 1400 A.D.
CL510 A very nice strand of early Historic beads from southern California. 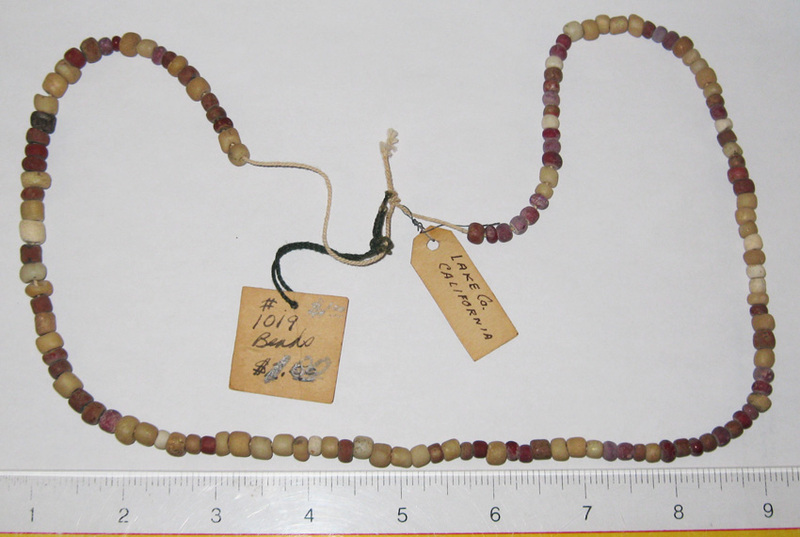 The interesting necklace comprises a varied coloration of small glass trade and stone beads, most measuring about a half centimeter in diameter or length with colors from cream to pale green and plum. Overall, the strand measures nearly 24 inches long and all in excellent condition, uncleaned, with strong patina. 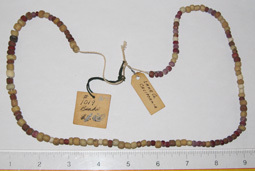 Two vintage tags are attached, one written with 'Lake Co. California' and the other with #1019 Beads' with '$2.50' overwritten in pencil with '$1.00'. Lake County exists just north of San Francisco. This piece was housed for decades at the Lakeview Museum of Arts and Sciences of Peoria, Illinois as a part of the Richard K. Meyer collection, on loan, and originally collected prior to 1930, probably as a part of the highly important Edward Payne collection which Meyer bought during the Great Depression. 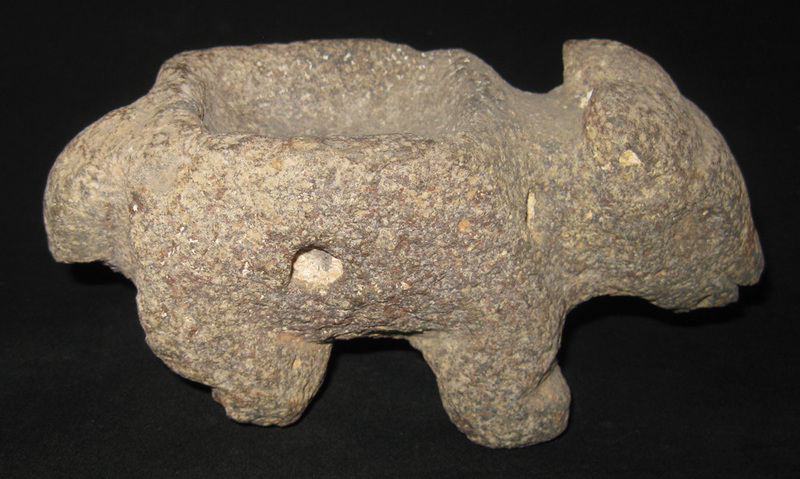 CA206 A large and scarce central California Pre-historic paddle for grinding acorns into mush. Such implements are documented in an early Smithsonian publication as a Yurok or Chumash paddle for grinding acorns into mush; source-'Smithsonian Scientific Series; North American Indians; Author Rose A. Palmer; Smithsonian Institue, NY, 1910. 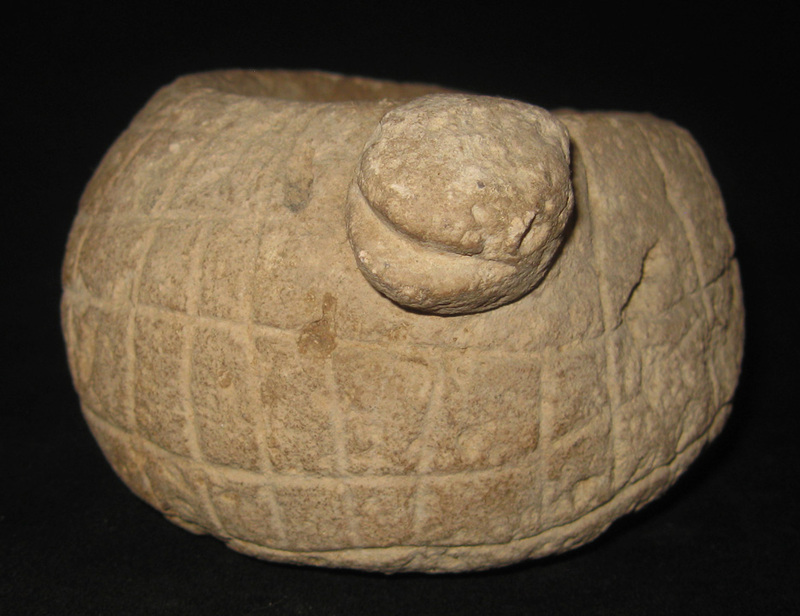 The stone implement is sculpted with squared bit and originally with long stem or handle, snapped in ancient times. This large example is well formed from a very dense caramel colored stone with various natural pitting. 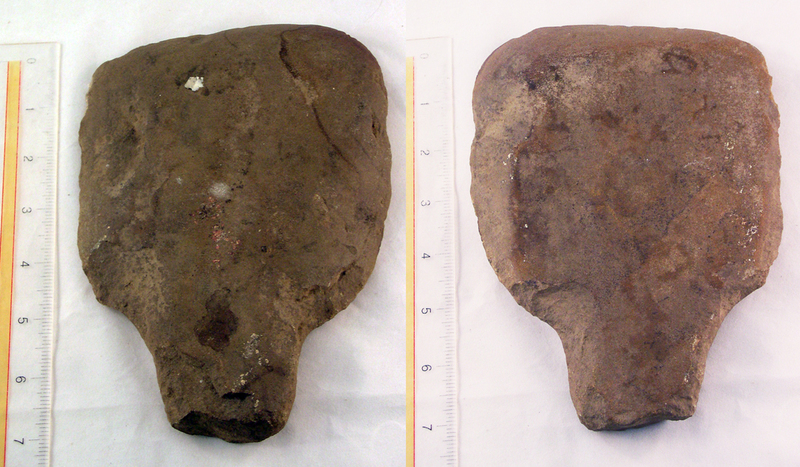 One side with very flattened face, the opposite with slight curvature. A heavily worn and useful tool, this could have been used for clam digging through sand or agricultural purposes as well as acorn grinding. Retains strong ancient mineral deposits and polish. 7 1/2 inches long, 5 1/4 inches wide and approximately only three quarter inches thick with tapering sides. Such paddles would, quite understandably, have snapped at this point of the handle. 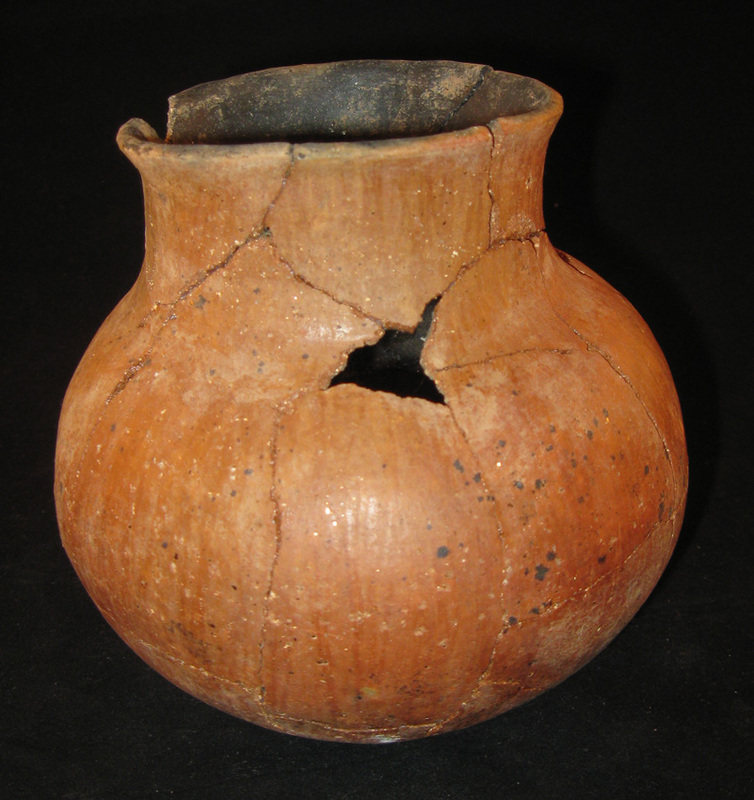 The early Smithsonian publication states that known intact examples are as much as two feet long so the leverage of such a stem handle would easily cause a break like this sooner or later. 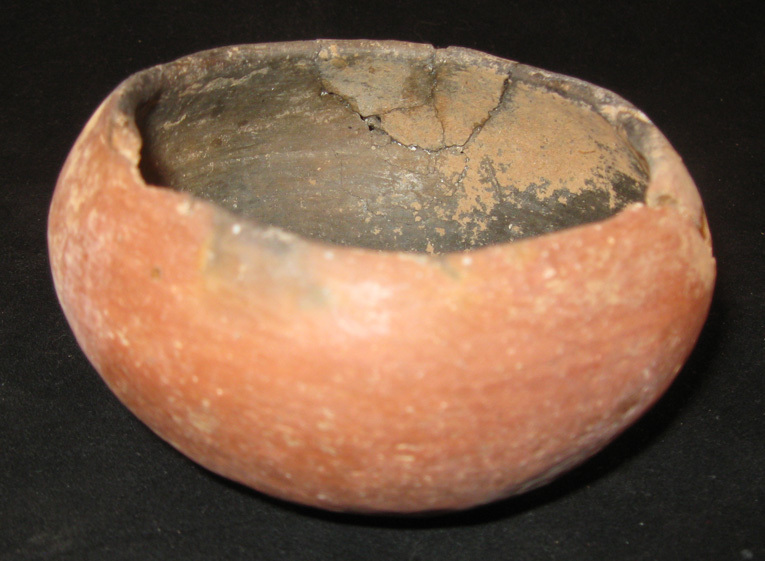 Further research shows that more wooden examples are known than the stone examples which makes this quite a RARE find! An impressive example from central California and dating to c. 1000 A.D. or earlier. 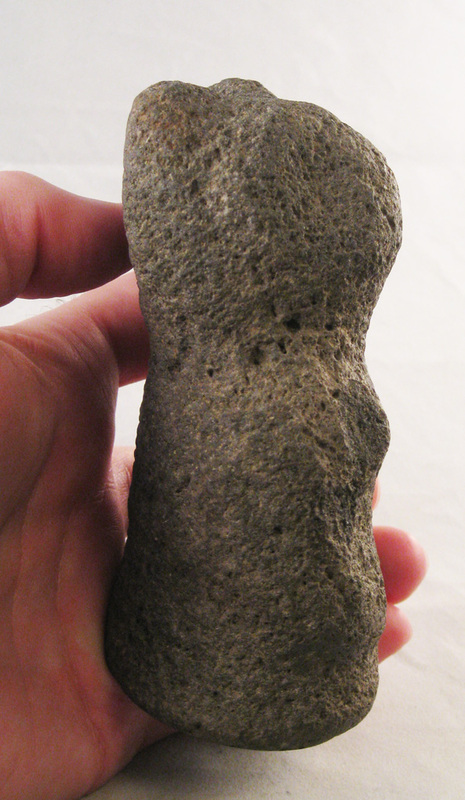 CA205 A wonderful California Pre-Historic shark vertebrae necklace. 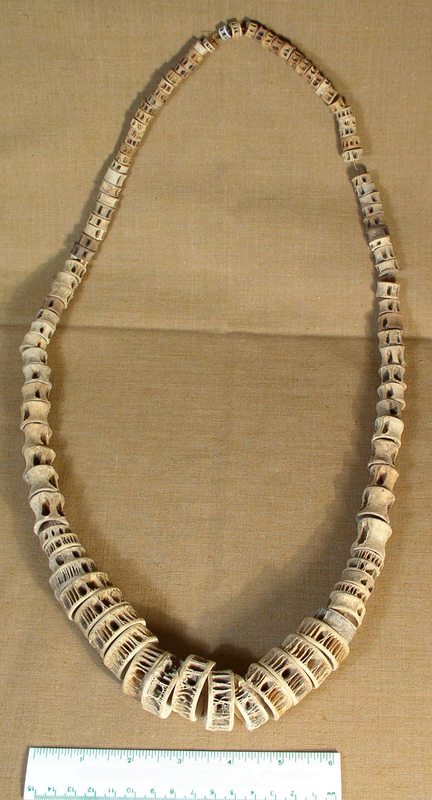 This rare necklace is a long strand of well preserved cartlilage vertebrae, most likely from a shark, and well graduated in sizes ranging from around 1.25 inches diameter to the smallest beads being 3/8 inch diameters. The necklace measures approximately 38 inches in total length and strung on a copper wire. 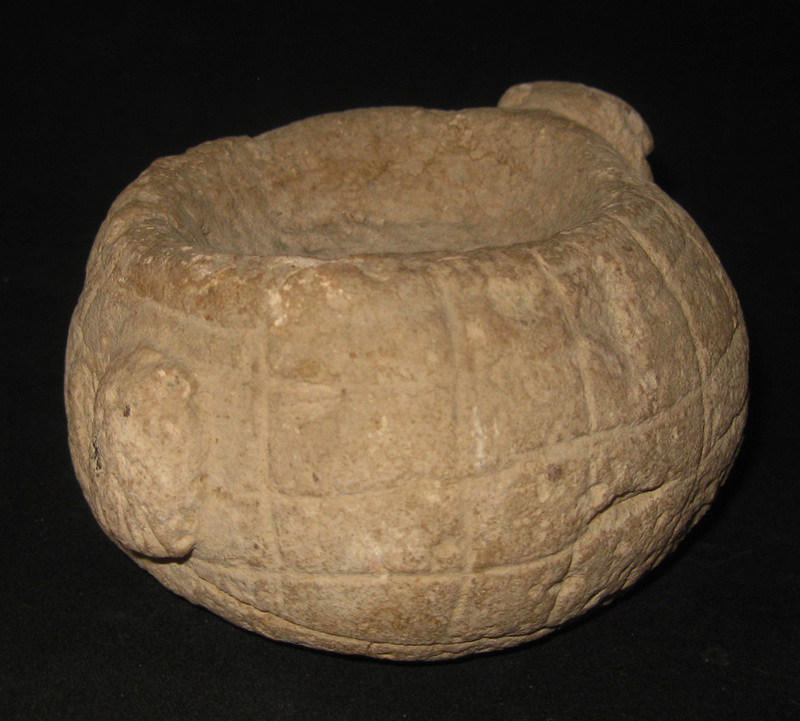 The beads are mostly all intact and excellent condition with strong soil patina and mineral deposits. Such material, due to it's fragile nature, is scarcely discovered so well preserved. Would make an excellent shadow box display. Pre-Historic Central to Northern California, ca. 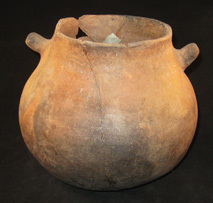 1000- 1400 A.D. This lot was housed for decades at the Lakeview Museum of Arts and Sciences of Peoria, Illinois as a part of the Richard K. Meyer collection, on loan, and originally collected prior to 1930, as a part of the highly important Edward Payne collection which Meyer bought during the Great Depression.